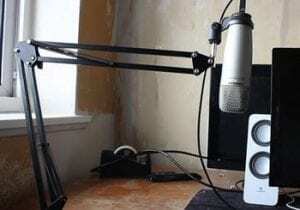 A mic stand is a “must have” accessory for anyone with the Blue Yeti microphone, as it offers better performance, ease of use and minimal desk clutter. The Blue Yeti is widely recognized as one of the best microphones to use for podcasting, playing video games, recording videos for YouTube or video conferencing. It is easy to use, compatible with multiple systems and offers great sound quality. But any microphone will be cumbersome to use if it is not attached to a stand. It will also provide worse sound quality when it is set up in an awkward position. With a quality mic stand for the Blue Yeti, users can get even more performance. There are many different mic stands available for the Blue Yeti. There are boom arms and desk stands from different companies. But what are the best options? We decided to create a guide to help you choose the best mic stand for your new Blue Yeti microphone. Here are the top five mic stands for the Blue Yeti. 7.1 What is the Blue Yeti? 7.2 Is the Blue Yeti the Best Available Microphone? 7.3 Do I Need a Blue Yeti Mic Stand? 7.4 What Type of Mic Stands Are Available? When price is no object, the Heil Sound PL-2T is an incredible option for the Blue Yeti microphone. 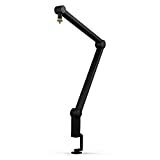 It is a boom arm that will provide all the flexibility, sturdiness and reliability users are seeking. The boom arm features internal springs and has removable top and back plates, which allow for easy cable threading. It has a standard C clamp mount, which mean that you should be able to attach it to your computer desk with minimal fuss. When using a mic near a computer, some movement is inevitable. Whether it is through getting up, moving the chair, typing or moving the mouse, users will create some disturbance. But with a quality boom arm such as the PL-2T, these slight movements are not going to disrupt audio quality. It is easy to set up, secure, height adjustable and will deliver impressive longevity. Clamps to the table, so no screws are needed. Easily adjustable for perfect mic placement. Durability that should deliver years of regular use. Holds Blue Yeti perfectly in place, unlike generic boom arms. Not everyone is a fan of boom arms. Or perhaps you need a stand that is a bit more portable, if you use the Blue Yeti with a laptop while traveling. The Gator Frameworks FW-MIC-0821 is the best product in this category. It is a short mic stand with a compact base, which does not take up much desk space. But it can still deliver a max height of 23 inches. And its modestly-sized base is weighted, which means your Blue Yeti will remain balanced and stable all the time. There are cable management tools included with this mic, making it very easy to use. And the total weight of seven pounds means that it is more than sturdy enough to keep the Blue Yeti in position, even if you are typing or gaming while using the mic. Weighty and sleek desk stand. Max height of 23 inches. Another excellent option for those who prefer a boom arm, the Rode PSA1 is a quality accessory for the Blue Yeti microphone. It is rotatable for the full 360 degrees, while it has a max reach of 32.5 inches both horizontally and vertically. It is designed for Rode’s own microphone, but it is still compatible with the Blue Yeti. There will be no usage issues, as the boom arm can comfortably handle the weight of the Blue Yeti. It will keep the mic in place all the time. The only issue is that a shock mount is needed on the Blue Yeti, otherwise the USB cable does not clear the thumb screws of the stand. Comes with two different desk mounting options, depending on your preference. It has a two-axis swivel mount that allows you to position the mic as precisely as needed for different operations. Quality boom arm that will hold the Blue Yeti steady. 360 degree rotation and 325 inch horizontal and vertical reach. Swivel mount for accurate positioning. Will need to purchase a shock mount for complete compatibility with the Blue Yeti microphone. There is something to be said for an official product that provides great functionality. 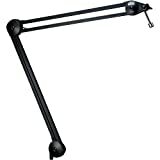 The Blue Compass Premium Tube-Style Broadcast Boom Arm is designed by Blue for its Blue Yeti microphone. While it is not the best boom arm on the market, it is affordably priced and will look very sleek when paired with the Blue Yeti. It has an all-tube, internal spring design. It does feature hidden cable management and has a very smooth, quiet operation. It is compatible with all shock mounts that work with the Blue Yeti. Its desk mount is a standard C-clamp, so you will not need any type of screwing onto a desk. The clamps are useful it means you can attach the mic to any desk, if you need to use it while traveling. Official Blue Yeti boom arm. Compatible with any shock mount that works with Blue Yeti. Some users complain it is not the most durable, as the bottom and middle locks eventually lose tension – causing the mic to fall down. The Blue Yeti is not a cheap purchase. It is a significant investment on its own. If you do not want to spend much more on a quality desk stand for this mic, the On Stage DS7200B is a terrific option. While it is not as versatile or weighted as the other desk stand we included in our list, it does perform admirably. You get height adjustment of 9’’ to 13’’, along with a base spread of 6’’. The entire mic stand is black, with a small logo on the arm. The shaft and locking clutch are both adjustable, so you can get good positioning for the Blue Yeti. While this is an inexpensive stand, it works better than what you get with the Blue Yeti by default. Shaft and locking clutch is adjustable too. Black color is sleek and goes nicely with the Blue Yeti. Weight is only two pounds, which means it may not keep the Blue Yeti as stationary as a higher quality desk stand. What is the Blue Yeti? With a modest price tag, sleek construction, excellent sound quality and multiple color options, the Blue Yeti USB Microphone is seen by many as the best mic to use with a computer. It features a tri-capsule array, ensuring it will produce great sound recordings in many different situations. Say you are gaming and you want your teammates to hear you clearly – the Blue Yeti is perfect. YouTubers and Twitch streamer also love this microphone, as it produces crisp and loud sound every time. While it will not deliver the high end sound quality of audiophile microphones, it is very useful for musicians and singers too. It is a plug and play USB microphone, meaning it takes seconds to pair with any type of computer. The Blue Yeti will also do a good job for audio conferences, voiceovers, interviews, field recordings and more. It works with Windows and Mac computers. Is the Blue Yeti the Best Available Microphone? If your goal is to get the very best sound quality, regardless of price, there are better options than Blue Yeti. It is not up for debate. So why is the Blue Yeti the most popular computer microphone on the market? Because it offers incredible sound, versatility and features for the price. The Blue Yeti has four different modes: stereo, cardioid, omnidirectional and bidirectional. The stereo mode will deliver realistic and general sound, which makes it good for video chatting or conferencing. The cardioid mode is suitable for podcasts, game streaming or vocals. Omnidirectional is a great option if you are recording a live demo or performance from a band, as it picks up rich sound from all directions. And finally, we have bidirectional mode that is going to shine when recording an interview between two people. The fact that such impressive modes are available in a mic that regularly retails for less than $150 is incredible. Mics with better performance will cost four, five or six times that price. It is why the Blue Yeti is the best value microphone for most use cases. 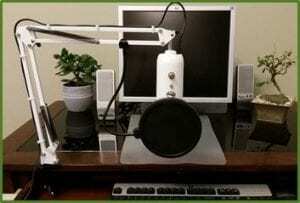 Do I Need a Blue Yeti Mic Stand? While the Blue Yeti is a tremendous microphone, as we mentioned above, it does have a singular issue. The stand that comes with the product is not the best. Many users have described it as flimsy, easily moved when on a computer desk and quick to pick up rumbling vibrations when in operation. If you are hoping to place your Blue Yeti mic on your computer desk, where you will use it to record audio of different types, you will need a stand. By getting a quality stand for your Blue Yeti, you will get even better sound performance. A quality stand ensures that rumblings and vibrations from the desk are not being picked up by the mic. It will also help keep the Blue Yeti 100 percent steady, even if you are typing on a desk. And you can clear up some desk space with special types of stands, such as boom arms. What Type of Mic Stands Are Available? There are two types of stands available for the Blue Yeti. There is the traditional desk stand, which will be a better version of what already comes with the Blue Yeti. Having a desk stand will help to add maneuverability and height positioning to the mic. Say you are not getting crystal clear and loud audio when recording your voice with the Blue Yeti. It is possible the mic is not close enough to your face while recording. Instead of trying to talk into the mic by bending down, you would get a desk stand that delivers additional height. The other type of mic stand that you can buy for the Blue Yeti microphone is the boom arm. This type of stand attaches to the side of your computer desk. Why are these useful? Because the boom arm will free up a lot of desk space, as you do not need to have its mount on the usable surface area of your desk. Since the Blue Yeti is a fairly sizeable and heavy mic, you will need a quality boom arm that can withstand that weight. The boom arm should also be flexible enough to offer you different height positions so you can get the ideal placement when recording with the mic. Boom arms are more expensive than table stands for the Blue Yeti. But their versatility and space clearing ability can be invaluable to some users. Seeking a top quality, versatile and easy to use mic stand for the Blue Yeti microphone? 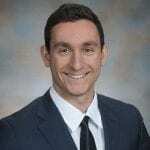 We hope that our guide is able to help you through the decision making process. The five mic stands we listed will perform admirably, ensuring you can clear up desk space and get the best quality from the Blue Yeti microphone. Those who want a desk stand should go for Gator Frameworks GFW-MIC-0821, as it is the best such product on the market. It has all the features and durability you will need. 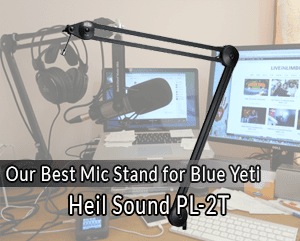 If you prefer a Blue Yeti boom arm, the Heil Sound PL-2T is a terrific choice. It is versatile, sturdy and will ensure you get the best sound quality out of your Blue Yeti while freeing up desk space. Purchased one of these mic stands? Share your experiences below. We would love to hear from you about your favorite mic stand for the Blue Yeti microphone.